Varied gameplay, fluid animations and beautiful landscapes make Unruly Heroes a platformer that's not to be missed. Unruly Heroes begins with the sacred, harmony-preserving scroll in tatters and a plethora of malevolent creatures spreading chaos throughout the land. It’s then up to four heroes – Sanzang the wise, Wukong the fearless monkey, Kihong the greedy pig, and Sandmonk the sensitive brute– to save the day. 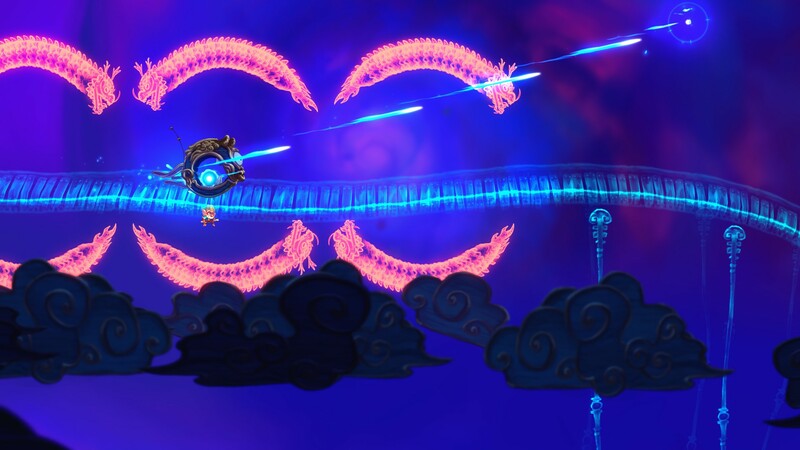 Magic Design Studios’ Chinese-mythology inspired 2D action platformer not only catches the eye from the very first moments, but also mixes a surprisingly varied offering of platforming challenges and mechanics with fast battles, making for one heck of a journey. Across its 29 levels, Unruly Heroes does an excellent job of varying up the obstacles it throws your way. Things start fairly easily with jumping over gaps, wall jumps and avoiding deadly spikes. Soon after, you’ll find yourself using a vase to vacuum ink clouds and draw platforms towards you, or a fan to turn lava into stone. 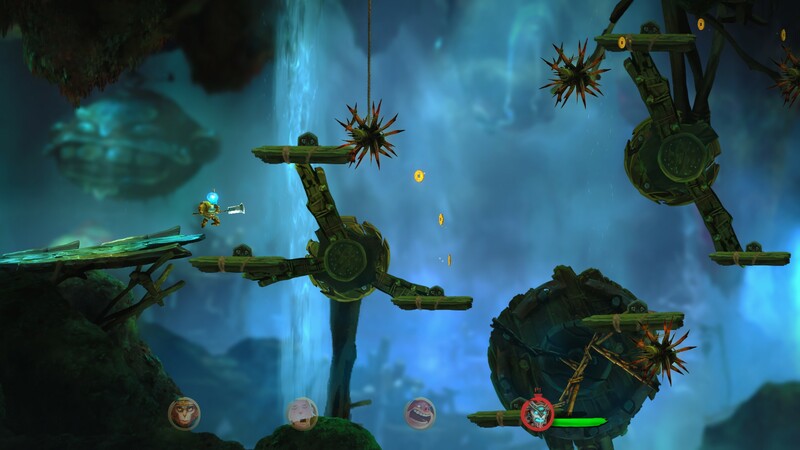 Other sections involve inverting gravity and relying on a spirit ball to jump from platform to platform, which, while a tad fiddly at first due to the floaty controls, aren’t impossible to master. To overcome these obstacles, the four protagonists bring different abilities to the table. Wukong and Sandmonk can double jump, while Kihong and Sanzang jump higher and are able to gracefully glide on their way down. While Sandmonk is able to shatter certain stone pillars, statues found throughout the levels enable Wukong to use his staff as a makeshift bridge, Sanzang to fire bouncing projectiles in order to open the way and Kihong to fill himself up with air and float upwards, much like a balloon. The four heroes can also take control of other creatures in a handful of levels. After delivering it a sound beating, I spent almost an entire level as one of the stronger wolves that could howl to make others follow him. While I dealt with obstacles in the foreground, the smaller wolves would replicate my actions in the background, also helping against a boss that went into the background to heal, only for the summoned pack to hurl spears at it to stop it from doing so. Another such case gave me control of a bug that could climb on walls. Both sections successfully refresh Unruly Heroes’ gameplay. Dead protagonists leave behind soul bubbles which, after a brief cooldown can be hit in order to revive them with a fraction of their health. Dying isn’t overly punishing in Unruly Heroes, as soul bubbles are generally easy to pick up, following you from the place where the character died. If you lose two characters, one bubble appears right where you respawn. On the other hand, in boss fights, you have to be a bit more careful as enemy attacks are more prone to shatter the bubbles, and losing all four characters sends you back to the checkpoint. Unruly Heroes’ combat is fairly fast-paced, requiring you to always be on your toes. Although enemies telegraph their attacks quite clearly, when multiple opponents join the fray movement becomes a vital tool to navigate the chaos. Dashing behind an enemy or through projectiles, only to smack foes in the back with your staff, fists or magical orbs feels as satisfying as it is quick. 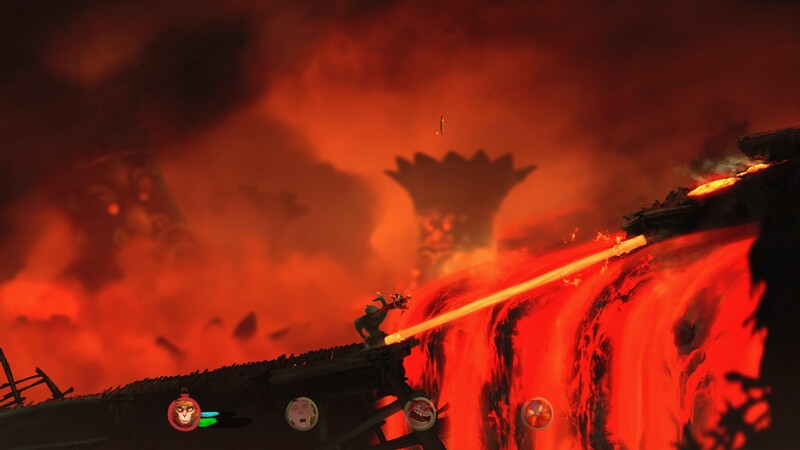 When levels have lethal spikes, chasms or lava, grabbing foes and kicking them into these hazards opens up an extra way to deal with opponents. Sanzang has efficient area of effect attacks using his magical orbs; Wukong makes use of his staff to attack targets both up close and at distance; Kihong can expand his size at the end of combos, while Sandmonk is an expert at doling out flurries of punches. They each have a super attack as well, their bars filling up individually depending on how much damage each protagonist deals. 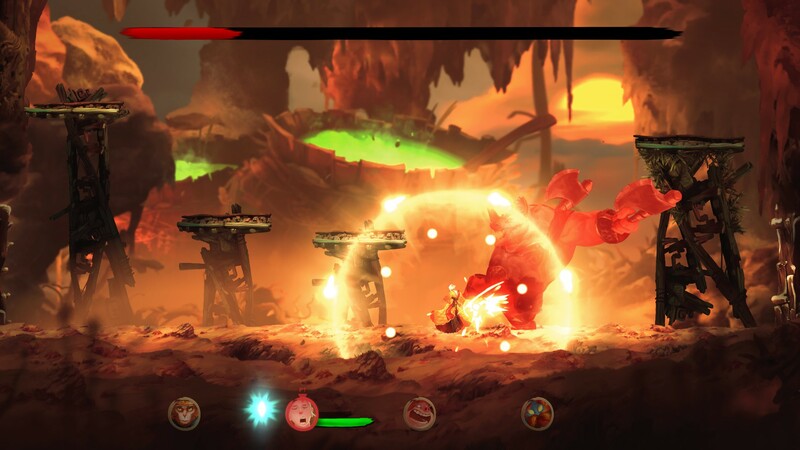 Where Sandmonk grows bigger, gaining temporary invulnerability and strength, Wukong attacks enemies in front of him with many damaging spirits. Kihong turns into a massive spinning ball of death, while Sanzang unleashes the might of his orbs around him. All four fighters have different styles and are slightly better in certain areas over others. For airborne combat, I ended up using Wukong more than anyone else. Unruly Heroes not only does a good job of distinguishing between background and foreground, but also uses the former to effectively introduce a few of its ominous large bosses. The game is a looker all throughout, its fluid animations, great use of color and imaginatively drawn characters acting as constant eye-catchers. 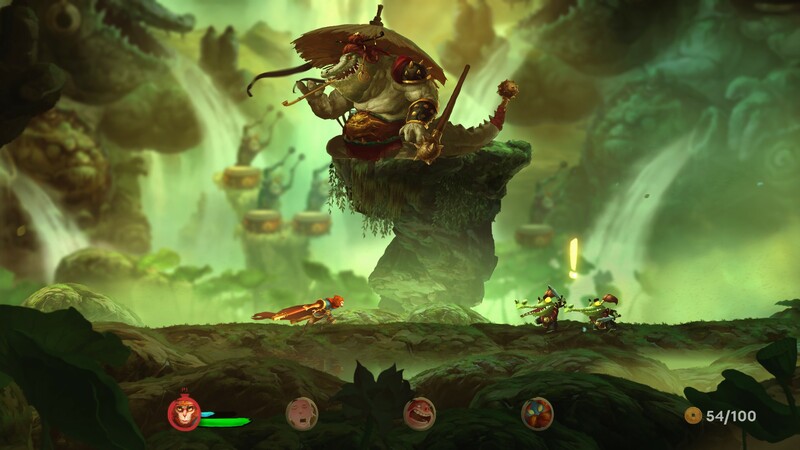 It’s no surprise that the people behind it had a hand in the recent Rayman Legends, as similar fidelity is found in Unruly Heroes. While definitely not the first game to feature an ethereal Underworld, or the lava-filled innards of a mountain, the title absolutely nails the right look and atmosphere of each of its areas. The story isn’t Unruly Heroes’ strongest focus, but its characters are quirky enough to fit its cartoonish tone. While loosely based on the Journey to the West novel, the writing takes on a rather hip, cool tone which, sometimes hits and sometimes misses, as does the voice acting. It’s all saved, however, by the extremely imaginative character design. It’s hard to take your eyes off this game. I have two main gripes with Unruly Heroes. The first involves there not being a way to go backwards when switching characters. While only an issue in a small number of occasions, it’s rather inconvenient to have to go through as many as three of the protagonists to get to the desired one, especially in tighter platforming sequences, battles or boss fights. The bigger gripe has to do with difficulty. For the most part, Unruly Heroes nails its balance of easing you in and gradually increasing the challenge. But ever so often, it throws unforgiving sequences your way that end up feeling like artificial difficulty spikes. One such bit required quickly targeting objects below me, while unable to optimally snap there using the keyboard. Several others involved very tight reaction windows, or chase sequences that required far too much trial and error before I saw them done. I don’t mind difficulty, but these felt egregiously tough, harming the flow of the game. Unruly Heroes shines through its efforts to keep things fresh both from a visual and gameplay perspective. It’s pretty to begin with, but as you progress through its story, not only will there be frequent changes in scenery, but they’re also accompanied by constantly refreshed platforming sequences and enemy encounters. Difficulty spikes and occasional control woes aside, the variety on offer here successfully keeps boredom at bay, while visually the title never ceases to impress. If you’ve even a passing interest in platformers, you can’t go wrong with Unruly Heroes.